There’s something charmingly endearing about the master of all evil, sniggering like a school boy. 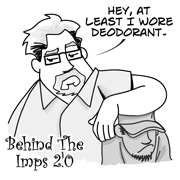 It IS Luci Phurr’s Imps, after all. Also, keep an eye out for a cunningly hidden EASTER EGG link to the return of an old favorite. The snickering twitter IS the most evil of all laughs. Far outreaching the manical laugh and the psycotic gaffaw. Will we get our Cat of Evil weekly posts back too? So how is it that God can know what every single organism on earth is doing/thinking and not know what Mr. D is thinking? I mean, does he have some sort of tin foil hat cleverly disguised? Salt in the OJ, or worse? The answer seems to be he was trying to make Mrs. G. happy and got distracted. Also there is that age old philosophical question: Could Mr. G create a being of such evil malevolence and petty childishness, that even Mr. G. couldn’t see the pranks coming? It’s a chin-off! A battle of the ridiculously huge chins of Mr. D and G to the death! Is it wrong to think that Mr. D is cute?